Highlighting the Spring Back to Vail festivities, the World Pond Skimming Championships is open to anyone and everyone that believes they can make it across the pond. It is guaranteed to be a wet and wild good time! Participants must be 14 years of age and older. The top male and female finishers will receive a 2018/19 Epic Pass! Registration opens Wednesday, March 14. Skimmers from all parts of the globe are gathering floaties and flippers and making the annual migration to the Vail Valley. Many will compete for fame and glory, while others have their eye on the grand prize, “The Golden Skimmer.” They are the unsinkable athletes that will showcase their water solubility on Lake Golden Peak Sunday, April 15, from 3-4:30 p.m. in a showing that defies the laws of physics and perhaps even common sense. The festivities extend beyond the World Pond Skimming Championships! 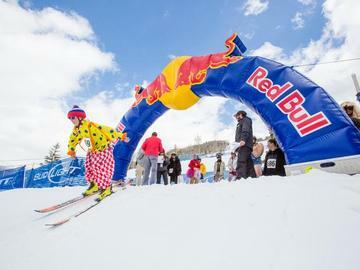 Check out vail.com/springback for the full schedule of Spring Back to Vail Events. Spring Back to Vail is presented by Vail Mountain, Bud Light, Pepsi, GMC, Verizon, Helly Hansen and Town of Vail, and brought to you in part by, Nature Valley, Vail Resorts Retail, Vail Racquet Club and Colorado Mountain Express. We are adding some new prize categories this year! Bring your best and you could win some awesome prizes. All competitors are required to wear a CE certified ski/snowboard helmet. Competitors who are legally intoxicated will not be allowed to take their run and will be disqualified. Competitors may only use a single pair of snow skis or a single snowboard as a means to cross the pond. No additional equipment or aid may be used (i.e. no water skis). Zero points will be given in the distance category for using any skis wider than 11.5cm at mid-ski (waist). No poles of any kind may be used. Absolutely no inverted aerials into the pond. You will be immediately disqualified. Absolutely no diving. You will be immediately disqualified. No starting above the start line. Only one participant may attempt crossing the pond at a time. Competitors may only attempt a crossing when the pond is clear of all people, equipment, debris, etc. The starter will signal when the pond and course are clear and a participant may attempt a crossing. The starter has the absolute final say. Do not try to ski/ride out the side of the pool. Please exit only at the end of the pool. If a competitor crashes before reaching the pond, they will be disqualified immediately (there will be no reruns). Registration will close at Saturday, April 14 at 5pm. Be sure to reserve your spot!